Reznor RP Series Rooftop Duct Furnaces are designed to be used as the heating component in a heating, heating/cooling, or makeup air system. The RP Series furnaces are certified for 80% thermal efficiency for use with either natural or propane gas, as specified, in sizes from 125,000 through 400,000 BTUH input. The furnace includes an integral power vent system which provides metered combustion air, dilutes flue products, and eliminates the need for a vent cap. The weatherized, aluminized steel cabinet is designed for outdoor mounting. A separate blower system is required for air delivery. The furnace has a Thermocore® aluminized steel heat exchanger with venturi-design tubes. The die-formed aluminized steel and include flared ports with a stainless steel insert. 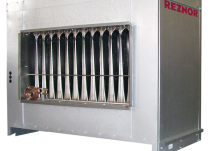 The Model RP furnace is approved for a temperature rise of 50°F to 90°F and includes “finger-baffles” for proper air distribution at these lower air volumes. Removing the finger-baffles increases the air flow and decreases the temperature rise. For temperature rise ranges, please see the table on the next page. Standard features include a spark-ignited intermittent pilot and a single-stage 24-volt gas valve. Each unit has all the required limit and safety controls including a venter pressure switch which verifies power vent flow prior to allowing operation of gas valve. For automatic operation, each unit is wired for field connection to a remote 24-volt thermostat. 1.Burner and control access shown left hand side (standard). Specify right hand side for opposite access and connections. 2. Standard air flow as shown. Direction of air flow may be reversed by field relocation of air flow baffles in the heat exchanger. 3. To install units side-by-side, specify one unit with standard left-hand controls and one unit with optional right-hand controls. Duct-work must attach only to separate duct flanges, never attach duct to heater cabinet. 4. All casing parts are suitable for outdoor installation. Heater mounting rails are 12 Ga. zinc grip steel. 5. One inch thick fiberglass insulation full length and width of top. 6. Approved for installation downstream of an air conditioning coil (optional drain flange, stainless steel heat exchanger, and stainless steel burners are recommended). 7. Not approved for residential use. ● Elevations from 2,001 to 9,000 ft.